Mission Statement: The Human Rights Campaign Foundation envisions an America where lesbian, gay, bisexual, transgender and queer persons are ensured of their basic equal rights - and can be open, honest and safe at home, at work, and in the community. 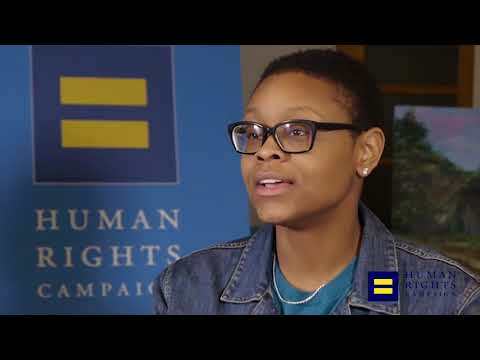 Through research, education and outreach, the Human Rights Campaign Foundation encourages LGBT Americans to live their lives openly and seeks to change the hearts and minds of Americans to the side of equality. The HRC Foundation was founded in 1986 as a 501 (c)(3) nonprofit organization, based in Washington, D.C.; the organization is affiliated with the Human Rights Campaign. The HRC Workplace Equality Project has been at the forefront of corporate equality since 1995. By providing resources, consulting and constructive pressure to tens of thousands of US employers, the Workplace Project has made LGBTQ equality a standard tenet of corporate best practices. The resulting benefit to employees, and the climate of acceptance it has promoted in the workplace and beyond, point the way for making equality a steadily growing reality in American life. Hallmark research and publications of the Workplace Project include the Corporate Equality Index, State of the Workplace and Buying for Equality Guide, among others. All Children, All Families, a joint project with leading child advocacy organizations to help child welfare/adoption agencies succeed in finding more homes for waiting children in foster care by tapping into the LGBTQ community. The Project's Welcoming Schools Program is the first kindergarten through fifth grade resource of its kind that proactively addresses family diversity, gender stereotyping and name-calling in a way that is inclusive of LGBTQ issues. HRC's Youth Well-Being Project, which is anchored by the annual Time To Thrive conference, and promotes safety, inclusion and well-being for LGBTQ youth. The HRC Health and Aging Program sponsors the Healthcare Equality Index. It examines national disparities in access to health care for LGBTQ people. Based on our hugely successful Corporate Equality Index, the HEI rates hospitals, long-term care facilities and other sectors of the health care industry on criteria related to LGBTQ equality. The Religion and Faith Program gives voice to the fair-minded faithful by acting as a catalyst to foster serious discourse on religion and the LGBTQ community. It counters evangelical rhetoric that condemns Americans based on their sexual orientation with reasoned exegesis of religious text used to reclaim the faith-based debate from intolerance in some faith corners, and open hearts and minds. The Youth and Campus Engagement Program empowers students to fight for LGBTQ equality on campus and beyond. The current group of high school and college-aged young people is more supportive of LGBT equality than any other generation in our country's history. The HRC Foundation provides tools and facilitating connections with other LGBTQ student activists across the country to achieve these ends. A subset of the program offers similar outreach to Historically Black Colleges and Universities. To abet the global march for LGBTQ equality, the HRC Foundation launched HRC Global in 2014 to empower sexual minority advocates from around the world. The HRC Foundation’s Global program held its first Global Innovative Advocacy Summit on March 29-April 1, 2016 at HRC headquarters in Washington, D.C., advocates from 26 countries met with HRC staff to share strategies for advancing LGBTQ equality, with a focus on how challenges have been identified and overcome across the world. Through a partnership with the Atlas Corps, the HRC Foundation has established a fellowship program providing leadership development for international LGBT advocates; fellowships last up to a year. The International Equality Project, which collects and communicates the state of equality internationally through timely media efforts aimed at increasing awareness among LGBTQ Americans and allies around LGBTQ issues abroad. More in-depth information about the programs discussed above is available on the HRC website at www.hrc.org/foundation. A downloadable brochure that details the HRC Foundation programs can be found at http://www.hrc.org/resources/foundation-overview. One of the best ways to support HRC is to donate to us through your workplace giving program (or the Combined Federal Campaign if you're a Federal employee). If your employer does not have a payroll deduction campaign or does not offer the choice of giving to HRC, ask about bringing America's Charities to your workplace. America's Charities works with employers to develop employee-friendly, cost-effective workplace giving campaigns that benefit charities like ours.